SFSFWI Kick Off Fall In Love! When taking into account sustainability, we also need to realize what are the environmental challenges and problems that are causing this distress. It is important to address as an industry, where the state of the planet is? And also, how we can shift as a fashion industry to change the current path we are on? Just like us, a strong partner of SFSFWI, the Ethical Fashion Forum is here to produce great change and develop educational tips about the environment, planet and land. When thinking about the land it is important to consider how textiles are made and if they are done in a sustainable way? If the material is not considered organic, it can be grown using pesticides, insecticides and other chemical to help keep bugs away and speed up the process. This process also ventures into the color dying process seeping into water and land, as well as posing serious threats to the health and safety of people working in these fields. The Ethical Fashion Forum states, that 22.5 % of the worlds insecticides are used during cotton production. Following a report in 2004, scientists discovered that the pesticides that are applied to cotton during the production phase can be detected in cotton clothing in chemical residues that affect the wearer. (www.fibtex.lodz.pl). These pesticides also carry on with the clothes if they get thrown into landfills, which seeps into the soil of the Earth. Some dyes, from a group called azo-dyes, have been proven to release cancer-causing substances, and have recently been banned by a European Union law. Until very recently, these chemicals were widely used. Finally, some chemicals such as formaldehyde, which is a skin irritant and has been linked to cancer, are restricted, but still allowed. A material that is taking action against this is known as organic cotton. 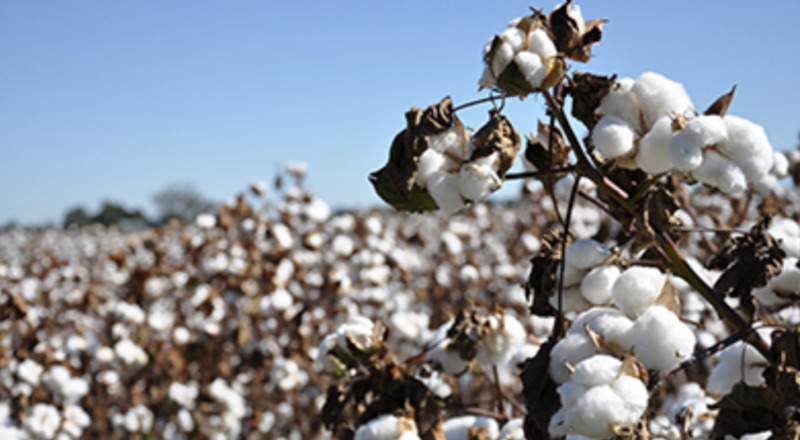 Organic cotton is grown using methods and materials that have a low impact on the environment. When a material is produced organically not only does the material feel better, but it also certifiably contains no pesticides and is created chemically free. Today organic cotton is widely used throughout the industry from Fast Fashion to luxury brands. Today it is not considered the most sustainable textile possible, due to high water use and over production, but organic production is a process in the correct step. The fashion industry is a thirsty business. Cotton accounts for 90% of all natural fibres used in the textile industry and is used in 40% of apparel produced globally. The ever-thirsty cotton plant takes over 30,000 litres to create 1kg of cotton. One cotton T-shirt uses approximately 2,700 litres of water (Water Footprint Network.) The Aral Sea has shrunk to just 10% of its former volume, largely through cotton farming. This is regarded as one of the greatest environmental disasters in human history. Huge amounts of water are also used in the wet processing of clothes, such as dyeing, washing and rising which has also polluted near by city-water-systems during production. The Carbon Trust reports that clothing accounts for around 3% of global production of CO2 emissions; this is during both manufacturing and during consumer use. According to Textile World, it takes 132 million metric tons of coal to produce 60 billion kilograms of textiles. Around half of these emissions occur whilst clothing is being worn, washed, tumble-dried, ironed and used, and mostly by North American, European and Japanese consumers. Choosing organic certified materials could help reduce the energy required to make a garment. An estimated 17-20% of industrial water pollution comes from textile dyeing and treatment and an estimated 8,000 synthetic chemicals are used throughout the world to turn raw materials into textiles, many of which will be released into freshwater sources (The Guardian, 2012). Even after wastewater has been treated, residual chemicals from the dyeing process continue to be present in water supplies. These residues can be carcinogenic, toxic, mutagenic and have detrimental effects upon human reproductive systems. According to the Pesticide Action Network, cotton uses 22.5% of the world’s insecticides and 10% of all pesticides, on 2.5% of the world’s agricultural land. Hello, We are SFSFWI Your global hub for sustainable fashion & Healthy Beauty.